This is another recipe that is often made in our family: the gnocchi from the potatoes. They are very good with a red sauce and lots of Parmigiano-Reggiano. Wash 1 kilo of potatoes, without peeling them, and put them into a pot with salty water and boil them. When they’re still warm, peel them and press them and put them on a kitchen counter with flour. Add some salt, the flour (300 grams) and make the dough until you have a compact and soft dough. Then you can add one egg and you can continue to make the dough. Then, you can make long strips with the dough and cut the strips with a thickness of 2-3 cms. Then you can put them on a tray with some flour. You can use your fork to make the typical stripes on the gnocco. You can make the gnocchi rest for 15 minutes and then you can cook them in a quite big pot with salty water and you can drain them as soon as they float. 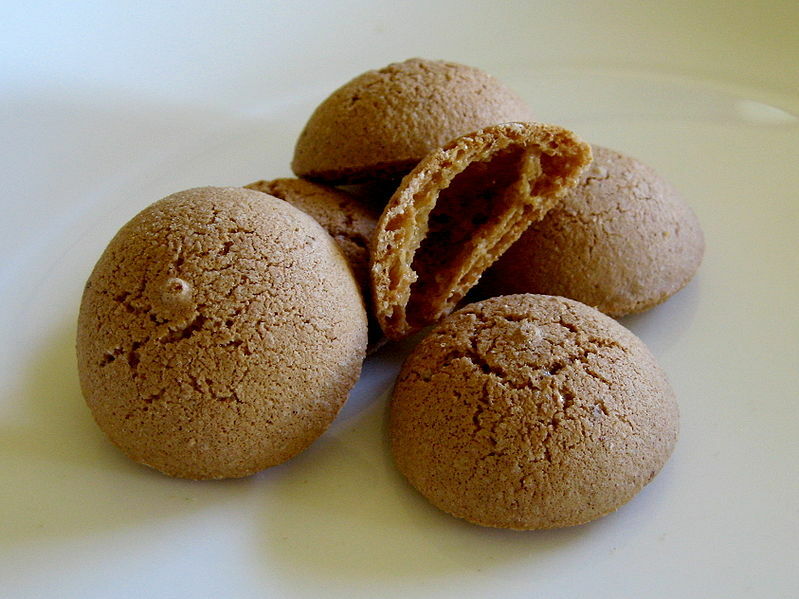 For the amaretti, I don’t know if you can find them in your country, maybe in grocery stores specialized in Italian food or in online stores. This recipe is very easy and enjoyable to do! 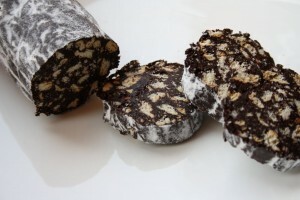 It’s also nice because here in Parma we have a very good salami and with this recipe you can make a salami which resembles the one made of pork, but instead it’s made with chocolate! Strange but very interesting! put it in the freezer for 2 hours. Serve cut into slices like a real salami. The balsamic vinegar glaze is a product made by cooking the balsamic vinegar and it has the texture of a sauce. After the balsamic has reduced by cooking, they add butter, sugar and flour. You can use it on French fries or on strawberries. It is easy to decorate a plate of grilled fillet or cooked vegetables thanks to the squeezable bottle and the drip catcher stopper. I’ve just tasted a new cheese… Rosa Camuna! These days I’ve tasted a new cheese, Rosa Camuna, which is a wonderful soft table cheese that comes from Valcamonica, a beautiful valley near Brescia. It is named Rosa because it resembles a rose, the symbol of the famous stone carvings, and it is produced with cow’s partially skimmed milk. After one month of ageing it has a scented taste of the mountains. Every year I go to Sardinia for my holidays and, not only the sea is wonderful, but also the food. For example, they have wonderful fish, seafood. 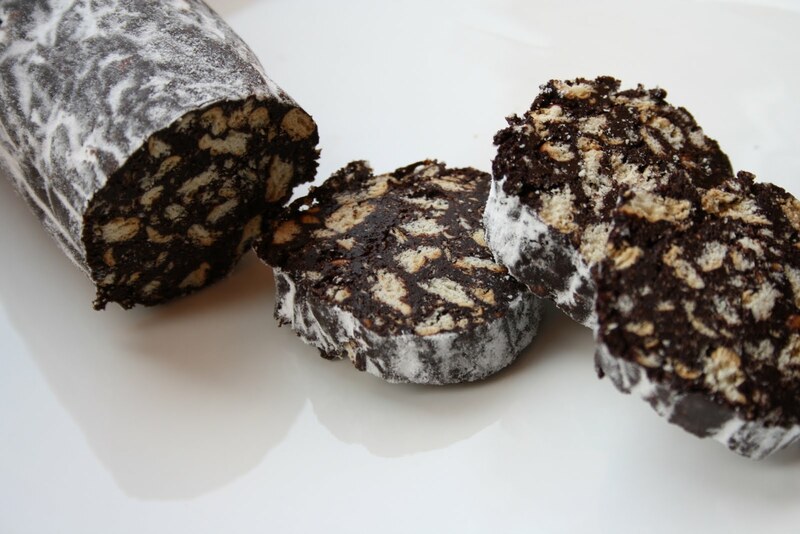 Even if Sardinia is an island, their culinary tradition is not focused on fish but on meat. 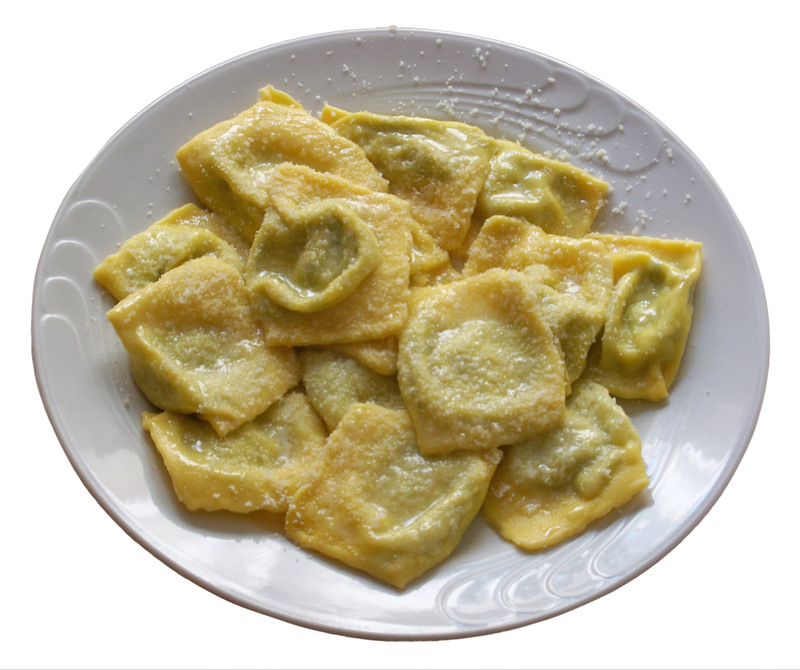 What I like most of the Sardinian food is the bread, called carasau or guttiau, the Sardinian pecorino (sheep milk’s cheese) and a pasta called gnocchetti. The most famous Sardinian wine is Cannonau, a strong red wine, but there is also a rosé Cannonau (rosato), which I prefer. Soften the mushrooms in a bowl with warm water. When they are softened, drain them and with a small filter made of cloth, filter the liquid and put it aside. Rinse abundantely the mushrooms. Repeat the process in order to take away the remains of sand without filtering the water again. In a small saucepan put a small quantity of oil that covers the bottom of the saucepan and brown the garlic. When the garlic has browned, take it away. At this point put into the saucepan the mushrooms and make them brown in the oil for a little while and add half a glass of dry white wine. The gas must be turned up to make the water evaporate. Then add a small quantity of broth to let the mushrooms be in a sauce. Cook with the low gas for at least 20 minutes. In the meanwhile make the water boil in a big pot. At this point put the tagliatelle inside the pot with a small quantity of kitchen salt. When the tagliatelle are cooked, put them into the saucepan and make them sauté a little. Serve in a plate covered with a light layer of chopped parsley. The gastronomic richness of Italy can be compared to its artistic richness. And in this case the cheeses aren’t an exception. In Italy we don’t have only Parmigiano-Reggiano, but also Pecorino, Mozzarella, Asiago, Fontina, Gorgonzola, Ricotta and many other cheeses. So, if the Parmigiano is the king of the Italian cheeses, it is in good company anyway. before processing it, the milk is filtered so that all the impurities are gone. They add the whey starter and the rennet for the coagulation of the milk. The temperature is 34°-38° degrees Celsius and the coagulation lasts 30 minutes. Then, they break up the curd with a “ruotolo” (it is a stick with a wooden disk). There are two phases: at first they break the curd up in cubes and then, after half an hour, they break it up again with the ruotolo. After extracting the curd, they put it on a table to drain for 15-30 minutes. After breaking it up, the curd is left to acidify with the whey for 3-4 hours or up to 8 hours. The quality of the mozzarella depends upon this phase. Then there is the manual shaping made by two operators, one holds the cheese and the other cuts it off (mozzarella comes from the verb “mozzare” which means “to cut off”). And then there is the salting in the brine. If you come to see the Parmigiano production, you will realize there are similarities and differences between the Parmigiano and the Mozzarella! (literally it means: Ravioli with herbs). Clean and wash the leaves of the beets well, make them boil in 2 inches of water in a big pot untile they become soft. In a side bowl prepare the ricotta, the beets that have already been drained and cooled down, then add the egg, the pinch of salt, some ground nutmeg and in the end put in the Parmigiano-Reggiano and mix everything to make it homogene and thick (to make it thicker, you can add some Parmigiano-Reggiano). Prepare on a board the flour and the semolina, make the fountain with the flour and semolina, add the eggs, the pinch of salt and the olive oil, mix well until it has become homogene and then preprare the rows and put the filling on the dough and wrap the pasta and close it. Then use the ravioli mould, it can be either small or big. Then you should pass them with the fork so that the filling does not come out from the pasta and no air comes in. Make the pot with water boil and when it boils, put the Tortelli inside the water and make them boil until the cooking is finished. It is better if the cooking is slightly underdone. Then dress them with melted butter and Parmigiano-Reggiano.